If you have autism or if you are a family member of someone with autism, you now have a unique opportunity to contribute to important research that can lead to better understanding and treatment of autism. Last year, the Simons Foundation and Autism Speaks announced the establishment and funding of a new collaboration among leading research institutions devoted to advancing brain research. In May 2014, the Autism BrainNet, along with its public outreach program It Takes Brains, was formally launched, and is urging people, whether or not affected by autism, to register for brain tissue donation. There is a severe shortage of brain tissue for research. Brain tissue must be retrieved within 24 hours of a donor’s death, and brain tissue donation is a separate process from organ donation. Because it has been so difficult for researchers to procure brain tissue without advance registration, It Takes Brains seeks to make the public, especially families affected by autism, aware of the promise of brain research and the critical need for people to register to donate brain tissue. The It Takes Brains website provides detailed information about registration and donation. The It Takes Brains initiative is being directed by the Autism Science Foundation, the MIND Institute of the University of California at Davis, Autism Speaks, and the Simons Foundation’s Autism Research Initiative (SFARI). A primary message of It Takes Brains is that people who register for brain donation are “Superheroes” in the mission to understand and treat autism. It Takes Brains profiles the Matthews family of New York, a family of five that includes a child with autism. Even though the Matthews family is coping with autism every day, they have registered with Autism BrainNet because they want to help future generations benefit from brain research. In order to obtain optimal research results, the Autism BrainNet needs to study brain tissue from donors with autism, from donors who are parents or siblings of people with autism, and also from donors who are unrelated to anyone with autism. The Autism BrainNet is currently comprised of the MIND Institute of the University of California at Davis, The Icahn School of Medicine at Mount Sinai in New York, The University of Texas Southwestern Medical School, and Harvard University/Beth Israel Deaconess Medical Center. There are plans to add sites for brain research across the U.S. and internationally. Autism BrainNet was formed because postmortem studies on brain tissue represent the best way for researchers to gain a deeper understanding of autism on the genetic, cellular, and molecular levels. While imaging techniques like MRIs give scientists some information, the only way to fully understand the differences in brain structure and functioning for people with autism is to examine the whole brain after death. The people behind Autism BrainNet understand that brain donation is a difficult subject for many and takes courage to discuss, but want the public to understand that brain research is the most promising way by which scientific research can lead to improvements in the quality of life for those on the autism spectrum. All individuals and families affected by autism need to discuss and plan for the future. While many families discuss wills, trusts, guardianships, and vocational and living arrangements, It Takes Brains is urging people who support autism research to take a step further and consider registering with the Autism BrainNet now, as a way of showing that they want to make a difference in the mission to solve autism. The It Takes Brains website covers many issues of concern to potential donors. Visitors to the site will learn, for example, that brain tissue donation does not involve any cost to the donor’s family, is permitted by most religions, and does not alter funeral arrangements or medical treatment. Further, while advance registration is encouraged, it is not required and it is not binding. In all cases, the donation process is initiated by a call to the AutismBrainNet hotline number immediately upon a donor’s death, after which an Autism BrainNet coordinator will work with medical personnel to retrieve the brain tissue and transport it to a research center. Donor families will be treated with respect and compassion, and provided with continuing support and information. 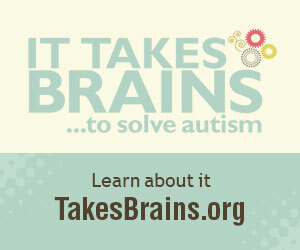 Please visit www.takesBrains.org and www.autismbrainnet.org to learn about brain research and to register.